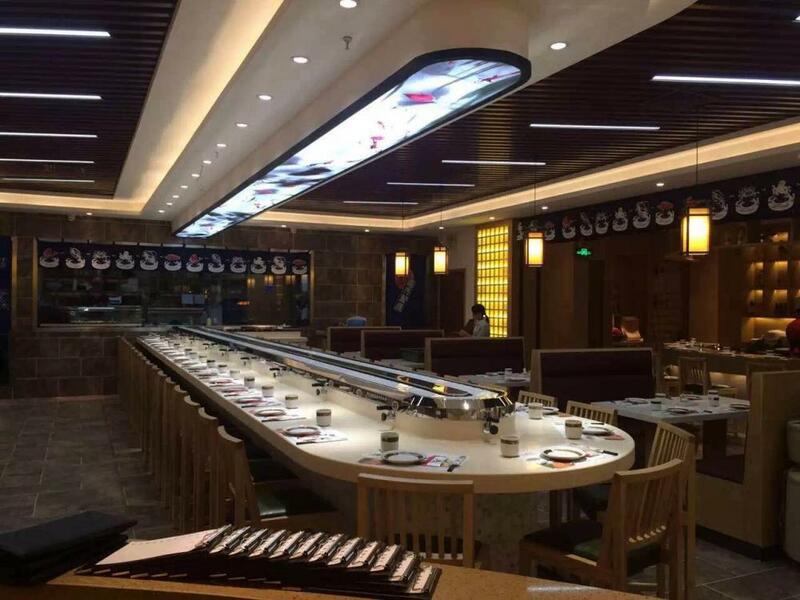 Double-track Rotary Sushi Conveyor Belt ,rotary conveyor belt,sushi belt maker,sushi equipment maker is also a very special sushi restaurant. Master is mainly to make good sushi into the plate in the food, the belt will be circling the turntable. Customers can pick up the ingredients according to their needs, such as checkout time, the clerk in accordance with the empty table in front of the customer's checkout, very convenient. Note: General foreign Rotary Sushi Equipment without faucet, if we can provide. 1, Double-track c sushi conveyor equipment and control components imported products. 2, The appearance of materials such as the use of mirror steel, design and layout are very flexible. 3, The conveyor belt width is 480mm, the conveyor belt length can be designed according to customer requirements. 1, Double-track conveyor equipment can be designed according to the layout of the store and customer requirements of any shape. 2., Meal table decoration materials can have a variety of selection, such as artificial stone, marble, hardwood, etc., under normal circumstances, we recommend sushi conveyor equipment to make artificial stone countertops. 3, The table below the decoration can also be based on store layout or customer requirements design a variety of styles. Decorative materials are marble, fire board, acrylic sheet, translucent stone, aluminum panels, etc., customers can entrust us to install or choose to decorate the local. Looking for ideal Rotary Conveyor Belt Manufacturer & supplier ? We have a wide selection at great prices to help you get creative. All the Sushi Belt Maker are quality guaranteed. We are China Origin Factory of Sushi Equipment Maker. If you have any question, please feel free to contact us.